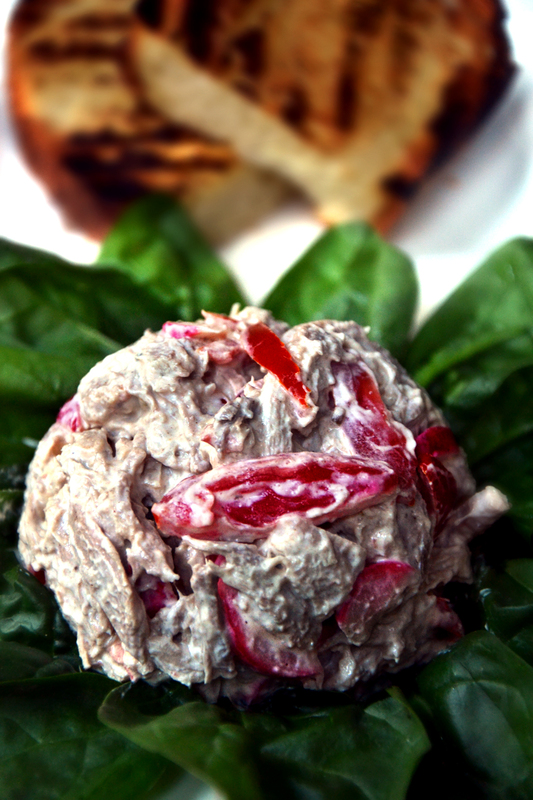 Pickled radishes, which have a peppery taste, are an excellent topping for sandwiches and salads. They give that contrasting consistence with its crisp texture, as well as that sweet and sour edge that I love in some dishes. The following recipe is an inspiration of the above-mentioned recipe (that you have to absolutely try!). Since the following preparation in Italy is called insalata di bollito (bollito is a combination of different boiled meats that is very common in Northen Italy), I used shredded boiled veal (bollito di vitella), which combined with some sweet datterini tomatoes and the peppery taste of piclked radishes gives the salad the balance and freshness I was looking for. Because of boiling and shredding processes involved in the preparation, this recipe is time consuming – but in the end it was worthwhile. 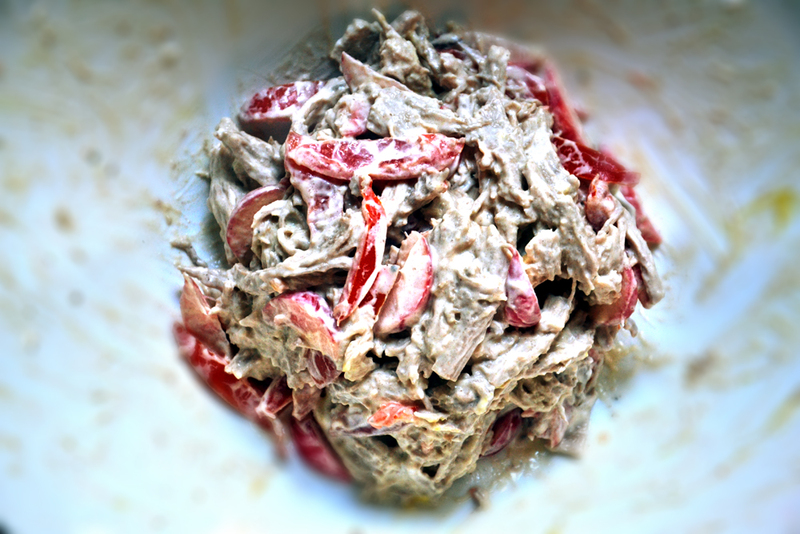 For this salad, the dressing I used is Greek whole yogurt with mustard, a choice I like because it gives that creaminess and tanginess without having to use heavy mayonnaise and vinegar (which sometimes if over-used, it overpowers the taste of other ingredients). In a boiling pot add veal stew meat and sprinkle it with salt and pepper. Add bay leaves, carrots, onion, garlic cloves and cover it with water. Bring to a boil for about 1 hour or until cooked. When cooked, set aside and let it cool. You can reserve the broth for any other preparation such as risotto or soup. Meanwhile cut radishes into wedges and tomatoes into fine wedges, discarding theirs seeds. When the veal has cooled off, begin shredding it with the hands. 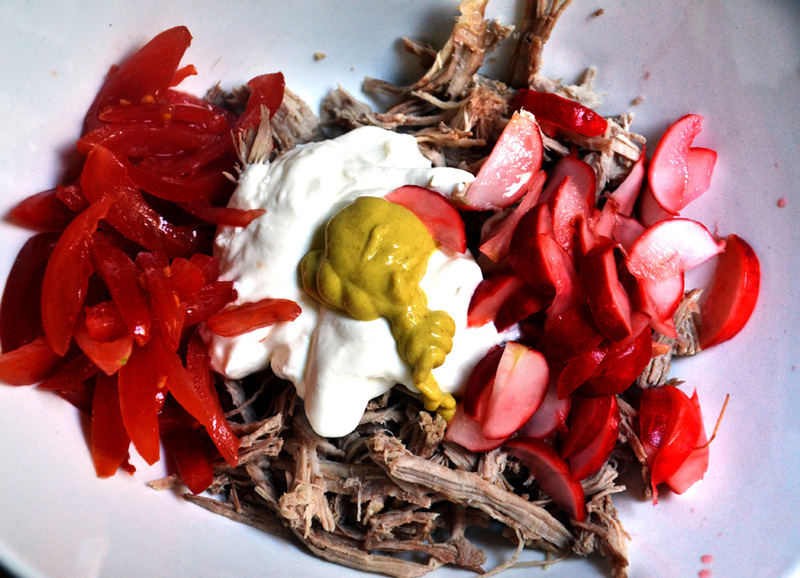 In a bowl, toss shredded veal, tomatoes, pickled radishes, Greek yogurt and mustard. Combine. Serve it with some grilled country bread. 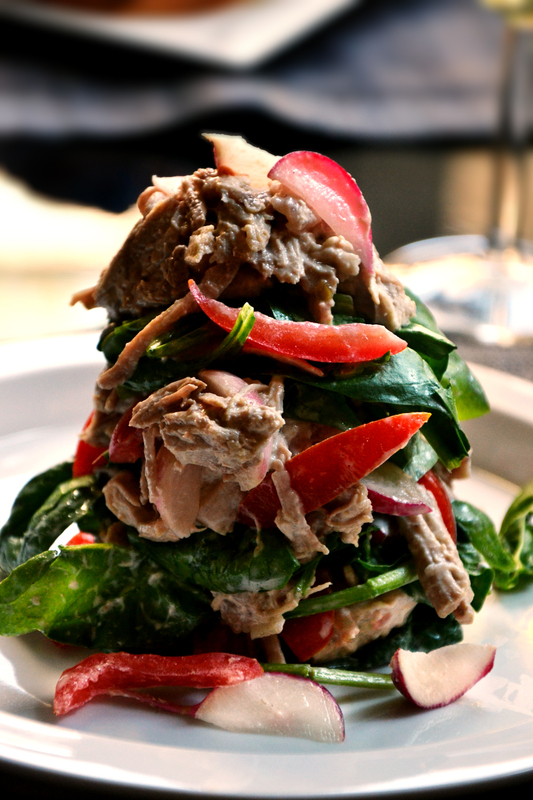 I like the combination of cooked meat and shredded fresh vegetables. I suppose leftover meat could be used, and that would save time. Ooh I love the sound of that. But now I’m craving bollito. Whenever we drive over from Spain to England, if we go straight to my parents she prepares this for us as she knows that after 2 days on the road eating picnic food (howver good it is) I crave something hot and soupy! 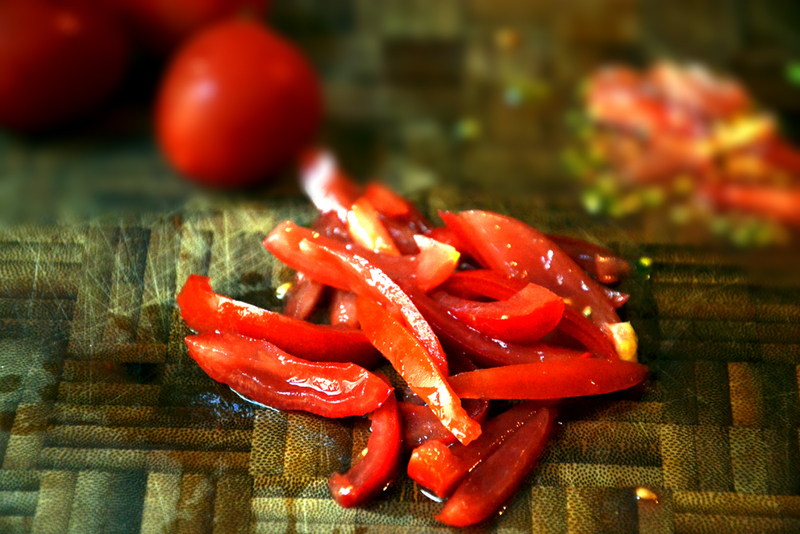 A true caponata. 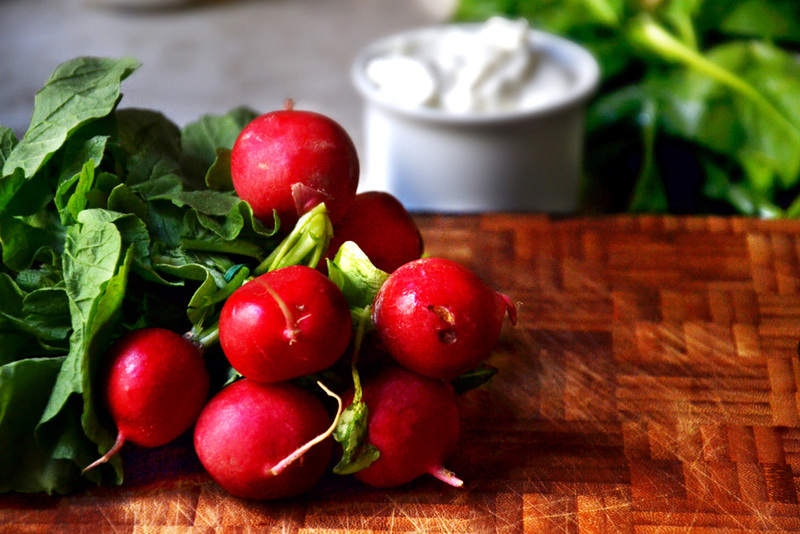 Love the idea of the pickled radishes, which I will definitely be doing. Really good pictures. 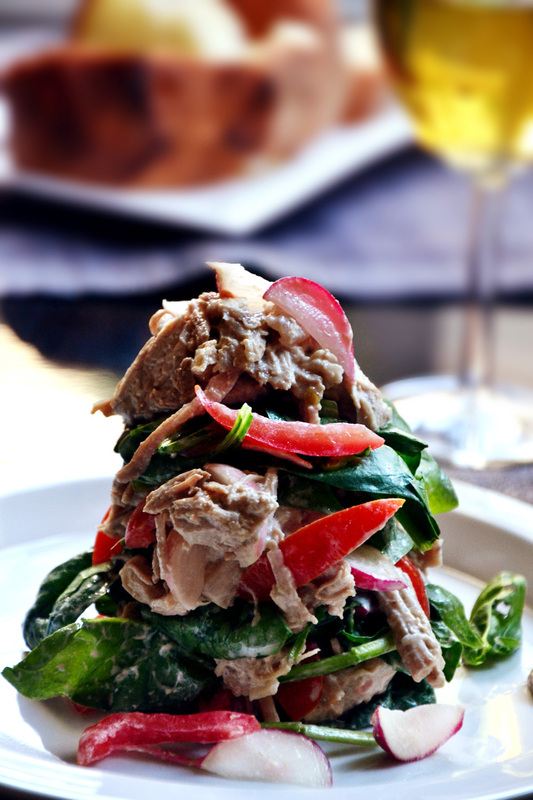 The shredded veal sounds amazing. sounds amazing! is it hard to make? Sounds like a delicious salad…a much more refined version of something my mother used to make but without the radishes. Great photos, especially the first one. We nominated you for a Liebster Award! It is for all up and coming blogs and we are in love with yours! Please hit this link for the details. Thank you for honoring me by both nominating my blog and by including it in such great company. I hope you’re not offended when I write that I no longer accept nominations and awards. This doesn’t mean, however, that I am any less appreciative nor grateful for your kindness. Again, thank you.